This wasn’t always the case. When Scandal premiered in 2012, it was celebrated as a brilliant, diverse procedural with a strong, black female character as its lead. Kerry Washington’s Olivia Pope was the first black female lead in a network drama since 1974, when Teresa Graves played the undercover cop at the center of Get Christie Love! 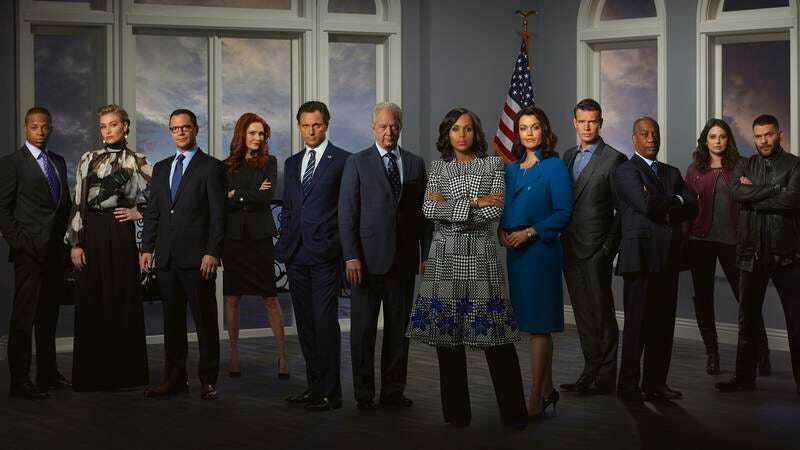 Scandal was never completely realistic, but the desires and conflicts of its cast felt somewhat relatable, with Olivia Pope & Associates helping closeted gay soldiers while dealing with the latest White House crisis. Scandal’s success ushered in a wave of TV shows led by black women, yielding hits like Empire and How To Get Away With Murder. But what does Scandal’s legacy mean when it and the shows that followed are losing audience members and critical goodwill? Like Scandal, both Empire and How To Get Away With Murder desperately seek their next “OMG” social media moment, rather than quietly emphasize character work—a key tactic in the Scandal handbook. If Scandal can be credited with helping these shows get on the air, perhaps its reliance on shock can also be blamed for the fall of the primetime soap opera. Scandal has always been at its best when it’s focused on its characters. Olivia has never been an obviously good person: In the very first episode, she threatens to ruin a young woman who claims to have had an affair with the president. But through it all, we’re urged to trust Olivia. Even if what she does feels wrong, her gut can do no wrong. All she has to do is look at President Fitzgerald “Fitz” Grant (Tony Goldwyn) and she can tell whether or not he’s lying. She makes mistakes, but she tries to fix them. She tries to find solutions for every side. Perhaps it was unfortunate timing: The show’s success aligned with the boom of advertiser-driven live-tweeting. Hashtags and retweets superseded reality. It was as though the writers’ room thought in GIF captions rather than actual dialogue, as characters rambled through self-righteous monologues and slapped each other for no reason. Underneath it all, motivations shifted as the plot required. These inconsistencies made it difficult to take any of their actions seriously, and Olivia’s gut just seemed like a joke by the show’s fifth season. Scandal set the stage for Olivia’s fall from grace when she was kidnapped in the middle of season four. Yet the motivation for that descent was muddled, since the show never seemed willing to let her go full villain. The writers let her stray a bit too far without consequences—she beat a man with a chair, but she’s quickly forgiven, and the audience was expected to retain its trust in her. As her co-worker Harrison Wright (Columbus Short) says in the first season, “She’s the best guy. It’s not enough to say it—you gotta believe it.” At this point, it’s hard for anyone to believe Olivia is good at all. It seems as though Scandal is finally ready to address this, but this self-awareness is coming too late. Olivia’s trip to the dark side was cemented seasons ago, but the show has still been trying to sell us on her white hat status. Without attention to character, Scandal is stuck repeating patterns, but it doesn’t work when the show continually ups the ante without consequence. Season six saw an assassination that involved Olivia’s father and a national terrorist attack that involved her mother. (Olivia’s parents have been distractingly over-the-top villains for awhile now, but Joe Morton and Khandi Alexander were born to deliver Scandal’s most tweetable lines.) All of these events were orchestrated by a shadowy organization with an unknown mastermind behind it; the introduction of another covert, evil group of terrorists was reminiscent of B613, the annoying Alias-inspired sideshow that ruined Scandal forever. Scandal was a series about people, their secrets, and their mistakes. Every unnecessarily complicated plot involving B613 only moved the show away from this. That’s what Rhimes has always been good at. She creates characters you want to live in and spend time with. Look at her biggest success: Grey’s Anatomy. As that medical drama lurches into its 14th season, its best moments are still tied to the staff of Seattle Grace Mercy West Hospital. Sure, another bomb went off in the hospital this season, but the show has felt more grounded recently. Instead of Kyle Chandler exploding all over Dr. Meredith Grey (Ellen Pompeo) in a hallway, this season’s heart-swelling moment focused on someone’s choice to leave the hospital. That’s it. An important character simply decided to quit her job. Back in Grey’s Anatomy’s splashier days, she might have died after some drawn-out, desperate surgery, but such moments don’t feel productive to the show’s narrative anymore. The latest TV trends point to increased interest in emotional moments, rather than action-packed espionage thrillers. This Is Us, NBC’s family-focused tearjerker, was broadcast TV’s biggest new show this season. It’s already been picked up for two more seasons and helped NBC finish No.1 among the advertiser-coveted demographic of 18- to 49-year-olds. While This Is Us is emotionally explosive, it mostly depicts realistic situations—characters quit their jobs, a man meets his birth father. Without a single murder, bomb, or secret spy agency, the show even managed to regularly trend on Twitter. Scandal is still capable of creating realistic relationships, and that’s the only reason to be optimistic about the upcoming final season. When Olivia and Fitz reunited in season six, it felt like a glimpse of the old Scandal; an episode that brought Abby (Darby Stanchfield) and David (Joshua Malina) back together also felt like the show rediscovering itself. The best narrative of the season involved Olivia handing Quinn (Katie Lowes) the reins to Pope & Associates, with Quinn adopting Olivia’s instincts and gut. Huck (Guillermo Díaz) and Charlie (George Newbern) form her unconventional family. They’re the only part of Scandal that still holds the show’s character-focused procedural origins. The decision to end Scandal shocked some fans. Despite ratings dips, the show remains profitable and could’ve coasted for a few more seasons. Instead, Rhimes and company seem committed to fixing their mistakes and getting back on track. In the rushed season six finale, the writers quickly removed the latest B613 replacement and got rid of a number of villains who’d recently been introduced. Whether or not this is enough to turn the show around completely, a concrete ending can hopefully give Scandal the goodbye it deserves. Through the nonsensical assassinations, terrorist attacks, and murders, Scandal is one of the few TV shows that allowed a black female character to be an antihero, a role her white, male counterparts have played for decades. For better or worse, Scandal is a show that transformed the broadcast TV landscape, and it deserves to go out on its own terms.